In late 2013 we ran our first Facebook readers rides contest with entries from across the country. In this issue we are featuring the top 20 bikes from that contest including the Baddest Bagger in Texas' Show Stopping Hater 2 Rat Rod bike from After Hours Bikes. 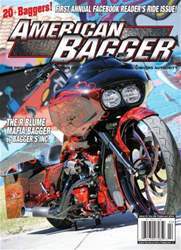 Also featuring the 2013 Lone Star Rally and the Baddest Bagger in Texas along with new products, Motors and Hop up Buyers Guide.